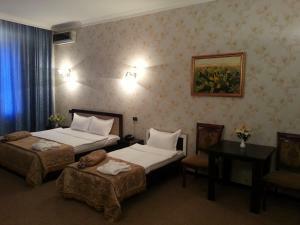 This hotel is beside the Azerbaijan Technical University, a 15-minute walk from the Old Town. The Miraj Inn Boutique Hotel offers a classic Art Deco exterior, design interiors and free Wi-Fi. 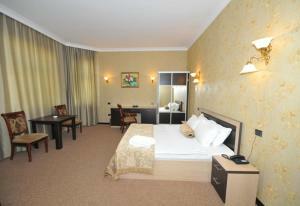 The spacious rooms at the Miraj Inn Baku feature elegant décor and stylish dark wood furniture. All rooms include air conditioning, a flat-screen TV with satellite channels and a private bathroom. A buffet breakfast is provided each morning in the classic-style dining room, which features yellow colours and paintings. Azerbaijani and international cuisine is also served here. Room service is available 24/7. Elmler Akademiyasi Metro Station is 500 metres from the Miraj Inn. The Huseyn Javid Park is also a 5-minute walk away. Reception is open 24/7 at the Miraj Inn Baku, and includes a tour desk and ticket service. Shuttles can be organised to Baku Train Station (15 km) and Heydar Aliyev International Airport (20 km).